Dodge, the manufacturer of the first minivan back in 1984, has introduced a special version of their Grand Caravan that is more manly, trying to leave the stigma of the minivan as only a ‘soccer mom’s vehicle. 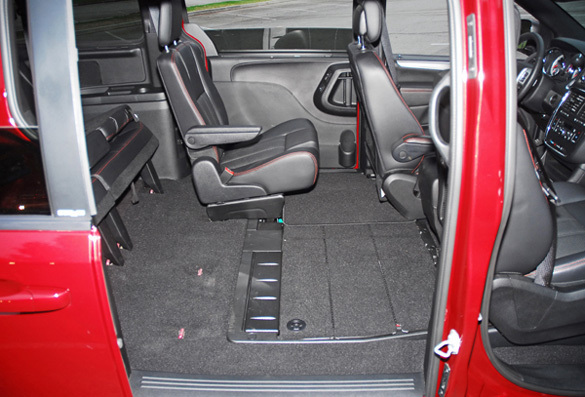 The all-new 2011 Grand Caravan R/T is certainly more macho under the sheet metal skin, inside the cabin with a more aggressive exterior design including all of the storage tricks and entertainment systems available only from Dodge. 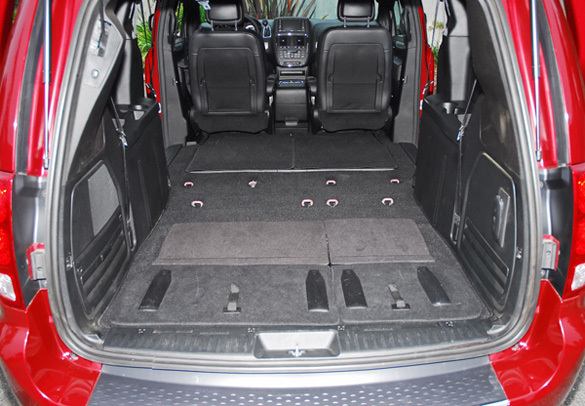 Just because a driver needs the versatility of a minivan doesn’t mean that the experience has to be boring. Dodge engineers redesigned and retuned virtually every system in the new Grand Caravan’s suspension. That suspension overhaul, combined with the new V6 engine that delivers best-in-class horsepower, gives Grand Caravan drivers a dynamic driving experience that other minivans in the segment just don’t have. R/T is where versatility meets performance and attitude. 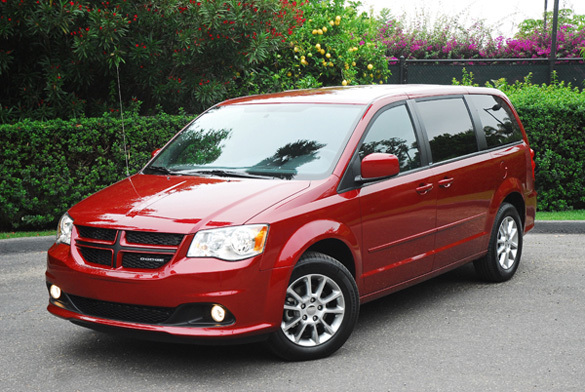 Uniquely designed both inside and out, the Dodge Grand Caravan R/T proves a driver doesn’t have to give up a spirited driving experience or their identity when they have a family. The 2011 throws down the gauntlet for a whole new level of cool transportation for families on the go. 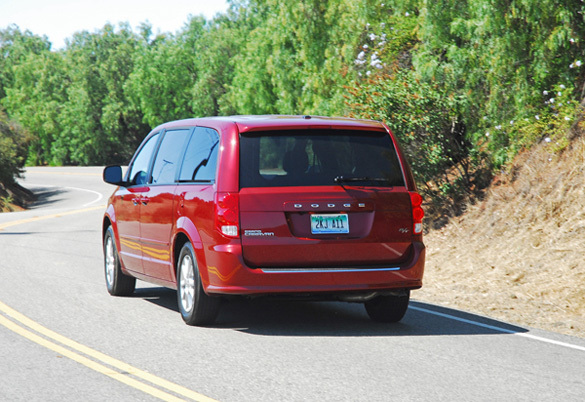 Dodge has redesigned the 2011 Grand Caravan to match its new attitude about driving with a sleek and athletic look. A new front fascia sports the new Dodge signature ‘split crosshair’ grille, a new hood and quad headlamps all combine to give the face of the new 2011 Grand Caravan a more aggressive feel. A new, more sculpted rear fascia and liftgate, new rear ‘ring of fire’ LED taillamps, a new Dodge badge, a 12mm lower ride height, new premium 225/65R17 inch lower-rolling resistance all-season radial tires , and a new rear spoiler all contribute to the new look and it’s class-leading aerodynamics and excellent fuel economy. Also new for 2011 is the latest innovation from the minivan leader: the Stow ‘n Place roof rack system that lets you stow the roof bows in the side rails when they are not in use, then snap them easily into place when needed. The ability to stow the roof bows when they’re not being used means less aerodynamic drag and wind buffeting and better overall efficiency. 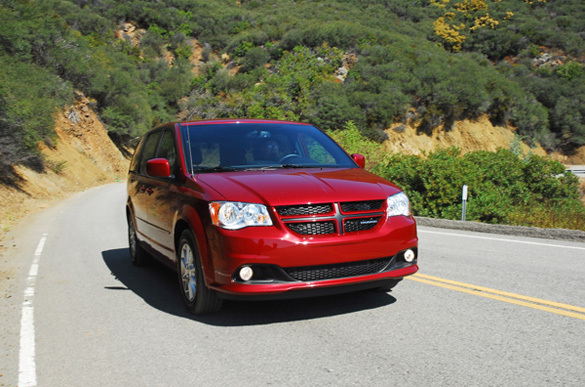 At the heart of the all-new 2011 Grand Caravan R/T is an all-new powertrain. The new 3.6 liter Pentastar DOHC, all-aluminum V6 engine is mated to a smooth-shifting six-speed automatic transaxle with AutoStick that allows you to shift gears manually when the spirit of higher performance overcomes you. This potent combination replaces all three of the previous minivan engines. 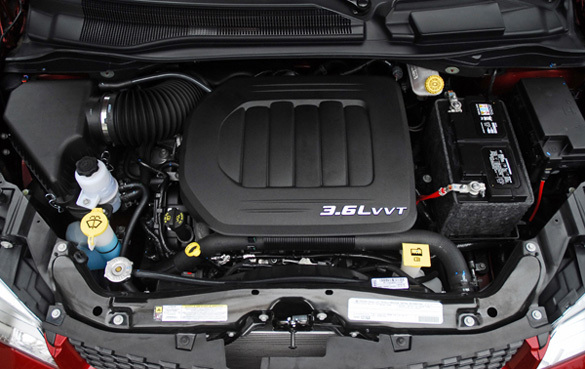 With the Pentastar engine, the new Grand Caravan delivers best-in-class horsepower, 283hp at 6,400rpm and 260lb.ft. of torque at 4,400rpm without sacrificing fuel economy of 17mpg/city and 25mpg/highway. 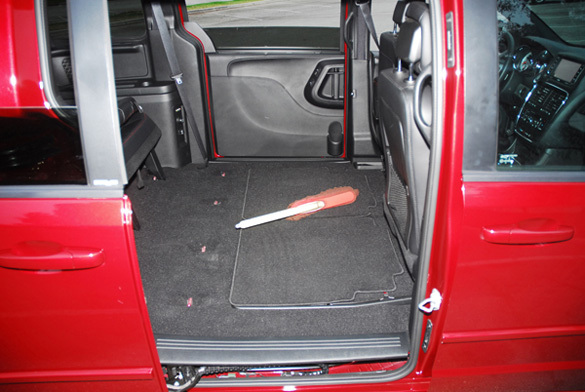 The 2011 Grand Caravan also features a new Eco mode which is a driver-selectable fuel economizer mode. You can change the transaxle shift schedule with the flip of a switch to maximize your fuel economy. The new suspension system has been re-tuned to give a smoother ride with better road holding capability. Up front is an independent MacPherson strut setup coil over gas-charged shocks, a stabilizer and an isolated suspension cradle. The rear setup is a twist beam axle with coil springs, a track bar, gas-charges shocks, or optional ‘self-leveling shocks’, and a stabilizer bar to keep the rear from leaning out when cornering. The power-assisted rack & pinion steering system is weighed on the heavy side that gives you a better feel for the road, a great on-center feel and quick responses to your inputs when driving around slow city traffic or when cruising along in the mountains. The brakes have also been re-worked and are larger-11.9 inch vented discs up front clamped with larger, aluminum seated single piston calipers and 12 inch solid discs in the rear also clamped with aluminum seated single piston calipers. Standard ABS, ESC and all-speed Traction Control work in tandem to help you keep control of your direction during severe braking maneuvers and when you are braking on wet or slick pavement. The R/T model that I tested rode on 17X6.5 inch cast aluminum wheels and wrapped with the aforementioned 225/65R17 inch Michelin Energy Saver all-season radial tires. 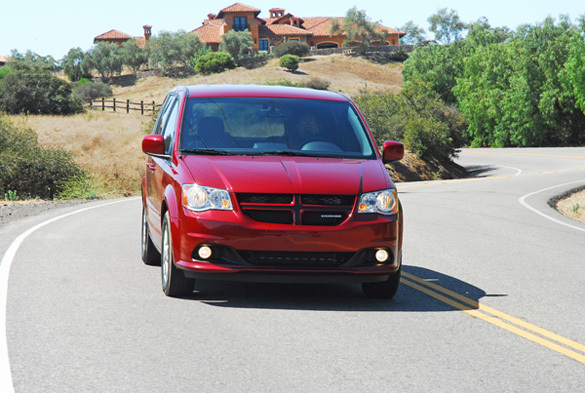 The new more powerful powertrain, re-tuned suspension gives the all-new 2011 Dodge Grand Caravan a ride like no other minivan on the market. But it is inside that really impresses. 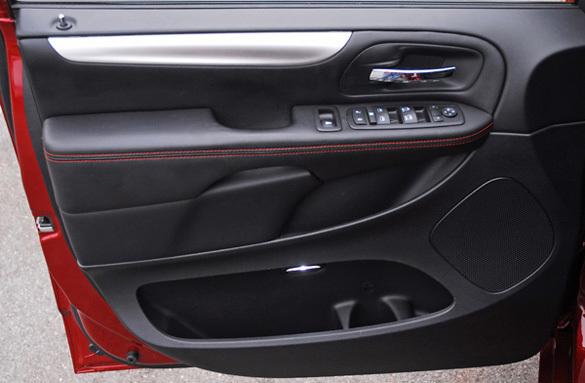 Owners will step into an all-new world-class interior for 2011. A modern, one-piece instrument panel uses soft materials, is more intuitive with improved ergonomics and larger redesigned gauges. Aluminum trim is found the center stack and larger aluminum plates are fitted onto the dashboard giving the new Grand Caravan a more luxurious look. The stick shifter is now located on the dashboard near the instrument cluster for ease of use. An available new ‘super’ center console provides clever functionality and storage for the active commuter, as well as easy driver/passenger access with a pass-through storage space for larger items, like a purse. Chrome trim rings in the console glow an ambient blue-green color, allowing passengers to find the items they are looking for at night. The instrument cluster is trimmed in chrome and easy to see and understand. All dials, switches and buttons are within easy reach for use day or night. The new Caravan also features more comfortable, largerStow‘n Go seats with a new, easy to use one-touch fold-down function. 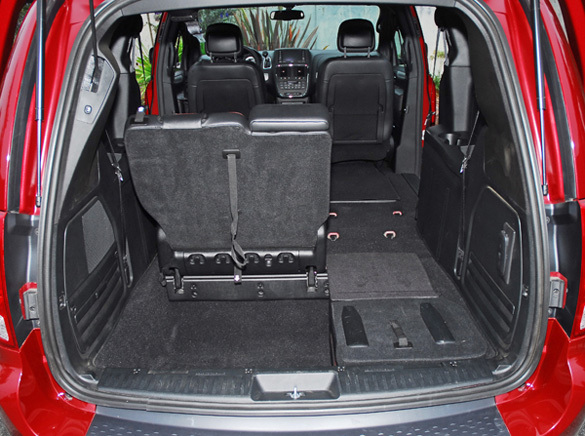 The two center captain’s chairs and the rear 60/40 bench seat can be configured anyway for your cargo storage needs. The distance between the wheel-housing is 49.1 inches so you can carry plywood sheets as well as host of other cargo good easily. 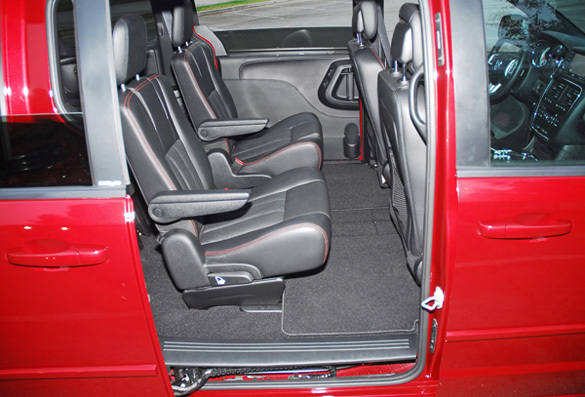 The front bucket seats are new and feature premium materials and new door trim are soft to the touch. It is all real luxury in a minivan. 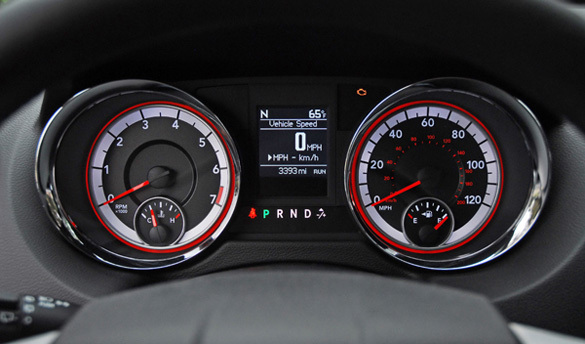 A new Dodge brand steering wheel with integrated controls for audio, navigation and speed control also offers the minivan segment’s first heated steering wheel option. The best storage in the segment rounds out the improved interior with a dual-tiered glove box, storage rails next to the front seats, and storage in all of the doors. Safety and security features include standard front seat-mounted side airbags, a new driver-side knee blocker airbag, three-row side-curtain airbags, 3-point safety belts for all seven seats, front/rear crumple zones, steel beams in each door, tire pressure monitoring system, remote keyless entry and the LATCH system for child seats. The optional Safety Sphere package includes ParkSense rear park assist system, ParkView rear backup camera, Blind-Spot monitoring and Rear Cross Path detection system, rain-sensing wipers, and automatic headlamps. R/T is where versatility meets performance and attitude. 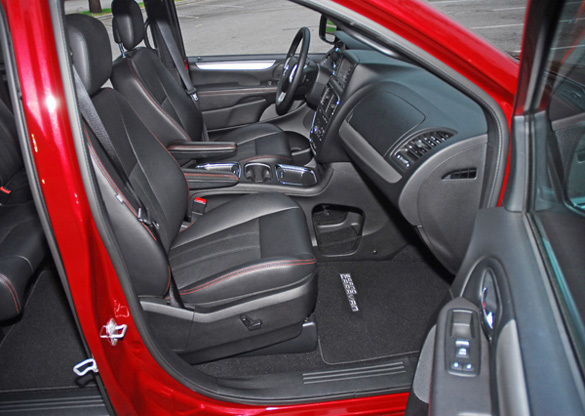 Uniquely designed both inside and outside, the Dodge Grand Caravan R/T proves a driver doesn’t have to give a spirited driving experience or their identity when they have a family. 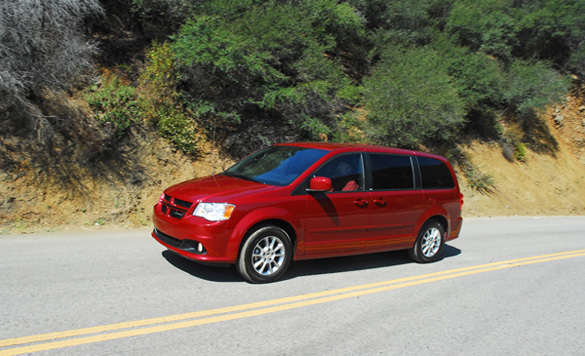 The 2011 Dodge Grand Caravan R/T throws down the gauntlet for a whole new level of cool transportation for families on the go. Towing with trailer tow pack: 3,600lbs.